ASRock Takes Intel® Ivy Bridge CPUs to Z68, P67 and H67 Series Motherboards! World’s top3 motherboard manufacturer ASRock today announced that its entire line of Intel P67, H67 and Z68 series motherboards will support Intel Ivy Bridge CPUs by updating the latest P version BIOS & Drivers! Via an Intel Ivy Bridge CPU, ASRock P67, H67 and Z68 series motherboards are resurrected. Users may expect more powerful processing speed yet lower power consumption by the world’s first 22nm 3-D Transistors. ASRock Sandy Bridge Motherboard Series are designed for mainstream enthusiasts who are seeking for stunning performance, solid construction without breaking their piggy bank. P67 brings native OC performance, H67 offers integrated graphics and the hybrid Z68 platform embraces dual personalities, allowing users to take all major advances over the previous platforms. Packed with Intel’s fabulous features, ASRock exclusive XFast 555 Technology and the support for new Ivy Bridge processors, ASRock Sandy Bridge Motherboard Series motherboards will definitely serve pretty much all your needs! The long and bitter wait has finally come to an end, now you may enjoy the sweet fruits which ASRock has promised. 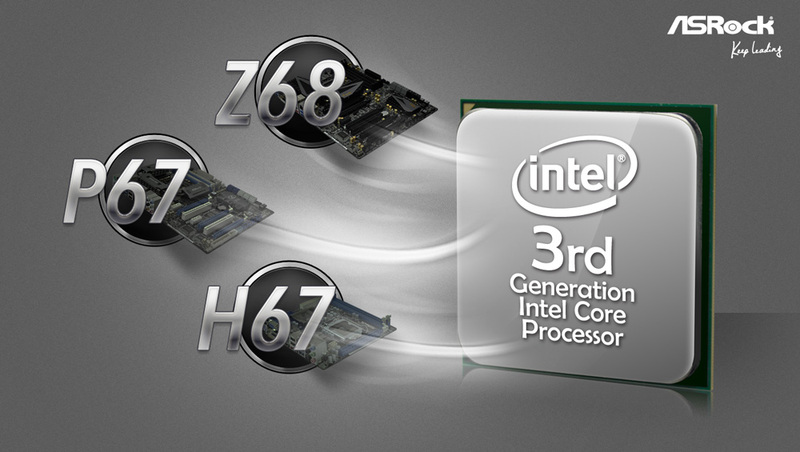 Be prepared for the overwhelming force of Intel Ivy Bridge CPUs. Hurry to download the new versions of P BIOS and drivers from the ASRock website right now! You are merely a click away from the 3rd generation CPUs, so what are you waiting for?